FedWriters provides high-quality graphic design and layout services. From infographics to book-length publication layouts, we offer complete design and 508 and WCAG compliance services. 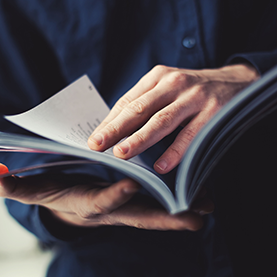 FedWriters provides expertise in government publications and ensures compliance with overarching guidelines such as the reporting requirements found in OMB Circular A-136 and the Government Performance and Results Act. We helped develop several high-profile publications, including the U.S. Customs and Border Protection Performance and Accountability Report, the U.S. Small Business Administration Strategic Plan, and a quarterly publication called the Cyber Defense Review. For each project, we bring together a talented team of writers, editors, graphic designers, and other specialists to ensure quality from inception to publication. FedWriters is a family. We believe that our employees represent the heart of our company. Our success and growth are credited to the professionals who make up FedWriters. Whether you’re a large, mid-size, or small business,we value your interest in teaming with us. Contact us if you’re interested in teaming with FedWriters.